One year – more or less – has passed since I published a post on Moz (formerly SeoMoz.org) in which I discussed how Twitter’s SEO problems were impacting online reputation management; while I think I’ve posted some better stuff on my own blog (ie. here), that article still remains the one people mostly contact me about and just a few days ago I’ve been asked via email if I had had any occasions to check if Twitter’s issues had been solved. Seeing the topic still attracts interest, I’ve thought a follow up post would have been useful, being Twitter’s SEO still a mess. 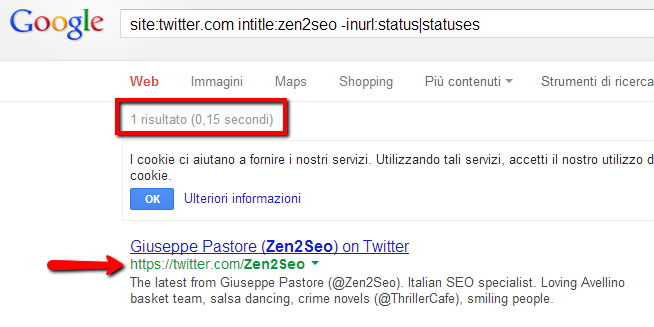 So, it looks like everything now is fixed: canonicalization is working fine and if you don’t link to the proper URL, you’ll still have Google loving your Twitter profile and showing it for your name/brand related queries. It’s more likely than one year ago, but a few problems still remain. Are there links you’ve lost? I can easily pick up a comment on the previous post in which Steve Morgan was saying he always had linked to his hashbang URL, and I was already underlining it wasn’t a good idea, since we didn’t know if Twitter would have handled the change properly. If you’re curious, you can check by yourself, but I’m telling you: they’ve done it in the right way, if you know how to analyze the situation. Someone at this point might wrongly state that links pointing to hashbang URLs are lost (at the moment, at least). 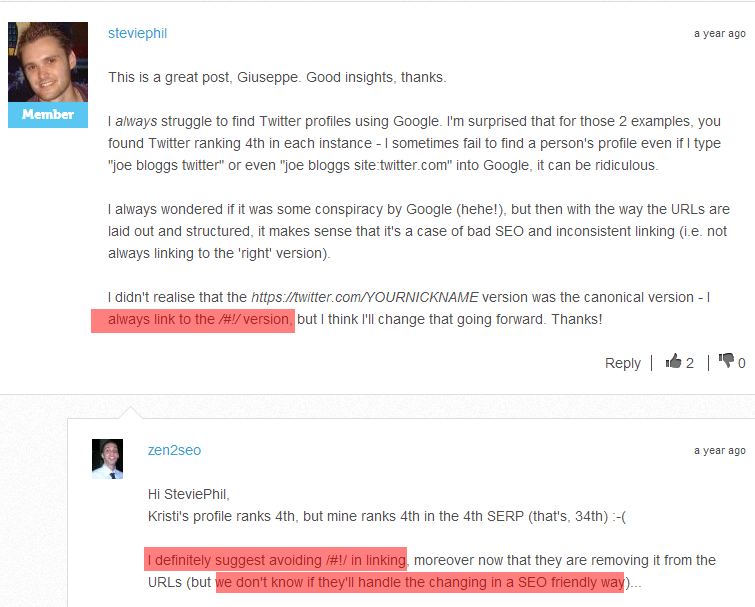 I’m glad I read your Moz post, Giuseppe… I now only ever link to the non-hashbang version (e.g. https://twitter.com/steviephil). TBH I think Twitter handled the whole thing terribly. The fact that clicking on any of the old hashbang links simply takes you to twitter.com is terrible UX, especially for those who still link to the hashbang version (and I’m sure I have a few old blog posts that do, too)! thanks for stopping by. Certainly Twitter’s priority isn’t SEO but they were doing really bad. It seems now they’ve fixed a few things, even if they aren’t handling mobile site properly, for example. Seems that Twitter’s on the right track with how they fixed their problems.